While thinking about the things that make me happy, things that cost little or nothing at all, it occurred to me that I discover, appreciate, or see little treasures every day, whether I am outside or at home–everyday surprises, unexpected treasures. These treasures can be as simple as time spent in conversation with a friend or someone you just met, discovering a beautiful architectural trim on a building down the street, appreciating a special space you have purposefully created in a room, or experiencing something unexpectedly profound–something that causes you to feel connected to the universe, comforts you, or challenges you to go in another direction. Finding and exploring a treasure can happen when your mind is relaxed and open, or when it is stressed and occupied with other thoughts. There are no rules, and seeing something cool can happen at any time. When I started writing down all the inspiring things I encounter each day (more about this in my post Keeping Notebooks) I realized how much these little things mean to me. I will sporadically share some of these stories here on Moments, Memories, & Jazz. 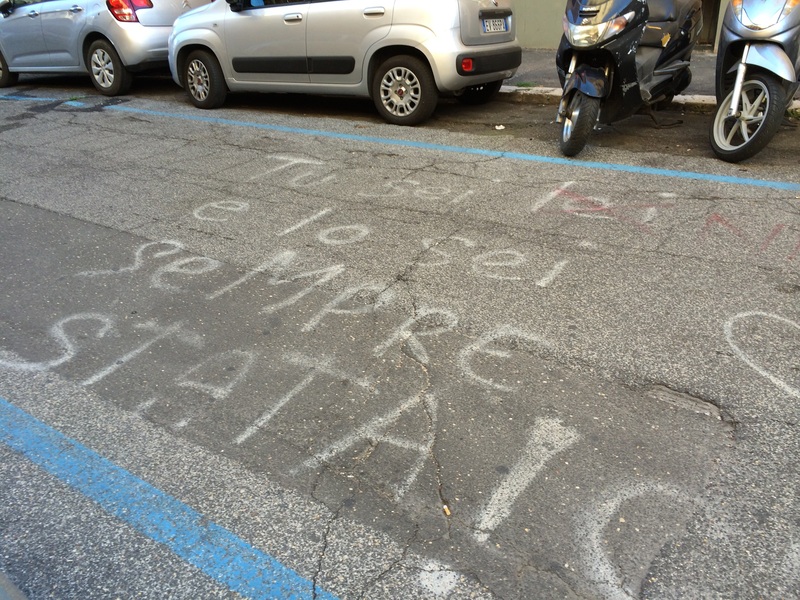 Today, I will tell you about two street messages that were surprising and wonderful. I might be thinking about a question, or a person, or a difficult situation, and then, as if in response, I hear a song playing on a store’s sound-system with lyrics that contain the exact advice I should take, or I look up and see something written on a wall, or perhaps I see a photo of something that makes me shift my priorities and realize that I should not take myself so seriously, that there are larger problems in the world. It is very comforting to feel this synchronicity, this symbolic answer to a question in my heart. Another variation on this idea is discovering physical signs that confirm thoughts I am contemplating, or should be contemplating. Because I am someone who reads a lot into everything (okay, yes, I over-think things sometimes) these found messages and images often seem to be signs from the universe that I am in the right place at the right time. And…this is exactly what happened, on one somewhat overcast Saturday, as I was walking to choir rehearsal. I was singing a song with lyrics I wrote. It was created for a couple of friends in Italy with lyrics about a personified moon, a “Roman Moon”. It is a song about falling in love with the nights in Rome, the silver moonlight, being enraptured with music. When I sing songs that remind me of my time in Italy, I begin to miss being there, and walking along the fabulous cobblestone streets. So, I was feeling a little disconnected. Then, as I traveled deeper through the Lower East Side, walking East towards Tompkins Square Park, something made me suddenly look up. 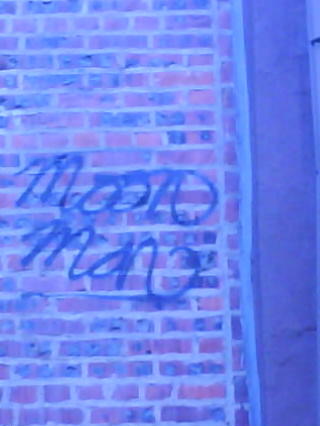 Perhaps I needed to switch hands–that large cup of tea I carry with me to all rehearsals can be VERY hot–I don’t know, but whatever it was, I was stopped in my tracks, someone had written “Moon Man” in script with black spray-paint on the 2nd floor of a red brick tenement building. I stood there for a few minutes, looking at it, wondering who managed to paint it all the way up there. It was just the perfect confirmation for me at that moment. I knew I would get back to Rome. That’s what it made me feel. I took a photo with my old flip-phone; a lovely sign to save. On my first night in the new room, I saw that there were cars and scooters and cycles lined up on the curb outside and it looked so cool to me that I took some photos; sticking my camera out the window. I wanted to capture everything I could in pictures; Who knows when I will be able to come back? (I need visual memories!) I did not notice anything unusual outside that evening. I took photos. I ran downstairs to street level to get a better view. I took some more photos. I felt like this was a gift. Not a rational thought, but that is how it felt to me. Later that morning, after posting it on social media, an Italian girlfriend tells me that this phrase is from a song by Ligabue, “Tu sei lei“, “You are her” (or “you are the one”.) She sends me a link to listen to it and I feel so connected, so in the moment, so happy to be in my little B&B getting ready to explore this wonderful city again. I discover other personal confirmations in the song lyrics as they go on to say “it must mean something” and it sure does, to me. They describe a woman with a foreign name, which I have, who turns up again, which I did, showing up in Rome a fourth time (I never in my life could have imagined I would visit Italy once, let alone four times!) and able to live alone, which is what I had been doing for the first time during my travels, a new experience; my family was at home, far away in the USA. Of course my logical mind tells me that someone wrote this sulla strada, on the street, for their girlfriend, or for another special reason, or they were just drunk and happened to have a can of spray-paint and wanted to celebrate their favorite song at that moment…but, the artistic part of my being, my magical-thinking brain, tells me that this was a lovely message that was waiting for me to arrive, waiting especially to make me feel welcome as I opened up my window to a fantastic morning in Rome. Previous PostHow Could I Forget Your Eyes?